Maria Clementina Sobieska (1702-1735) is one of three women honored with monuments in the basilica. 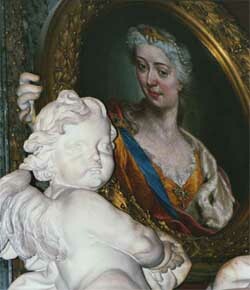 She was niece to the King of Poland and married to the Pretender of the English throne, James III Stuart . Designed by Filippo Barigioni, with sculptures by Pietro Bracci and work in metal by G. Giardini, it is typically 18th century in its overall graceful elegance, especially in the elaborate hairstyle of the deceased, executed in mosaic by Pietro Paolo Cristofari from an original by Ignaz Stern, and in the grace of the two small white marble putti which stand out well against the parallel veining of the marble pall. The emphatic figure of Charity, holding a portrait of the deceased in one hand and raising a flaming heart in the other, seems to be a last embellished manifestation of Baroque style. 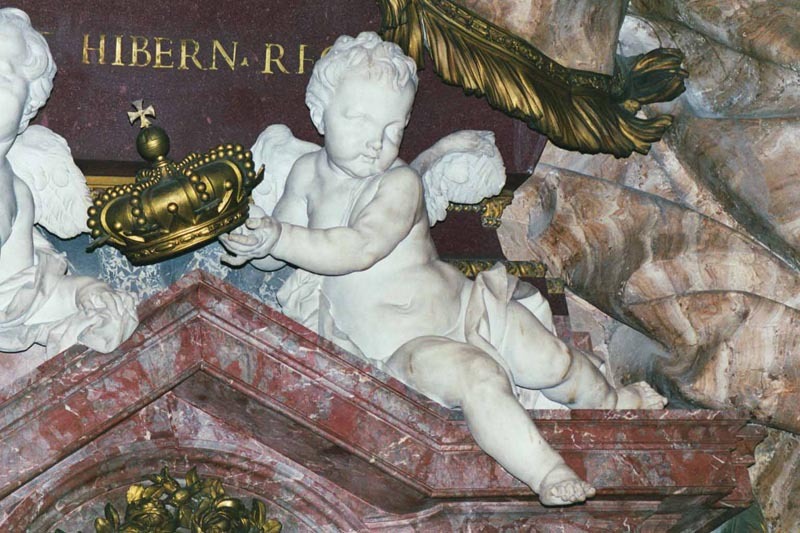 Above a porphyry sarcophagus surrounded in pink marble is a white marble figure of Charity raising heavenward the enflamed heart of the queen. 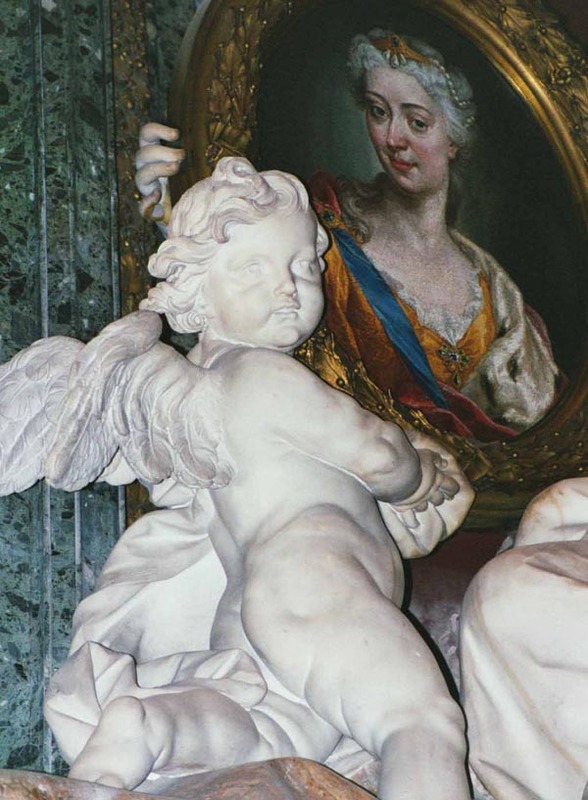 To the left of Charity is a putto (an angelic figure); between them they bear a mosaic portrait of Clementina who wears the blue sash of the Order of the Garter. 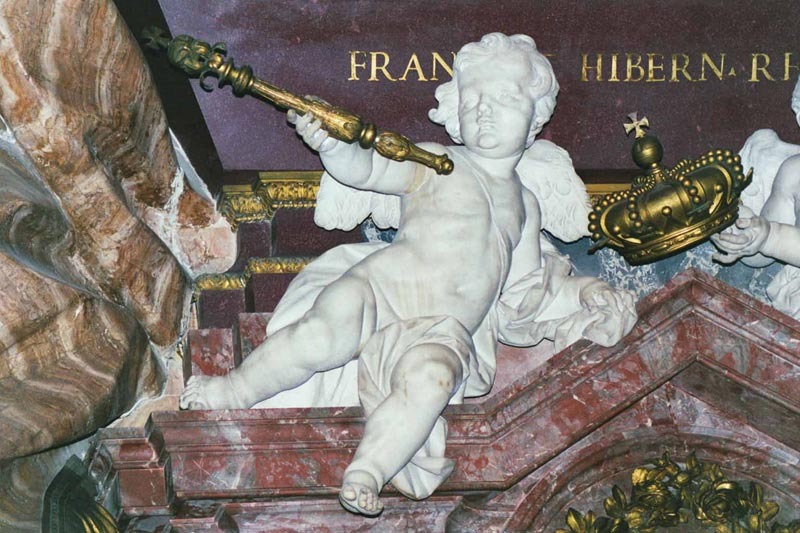 Below the sarcophagus two marble putti play, one with a gold sceptre and the other with a gold crown. 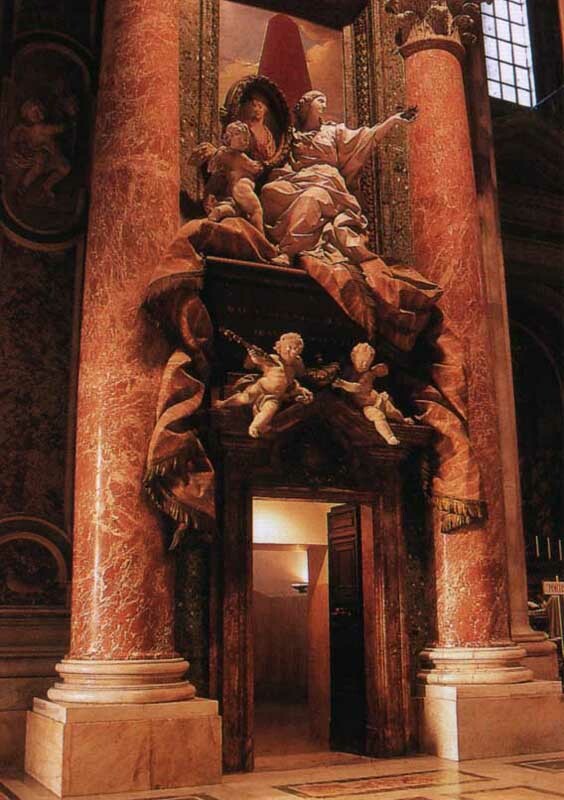 At their feet, above the door, is a gold wreath with a gold ribbon across it bearing the Latin inscription: "IV· KAL· FEBR" (January 29th, the date of Queen Clementina's death). 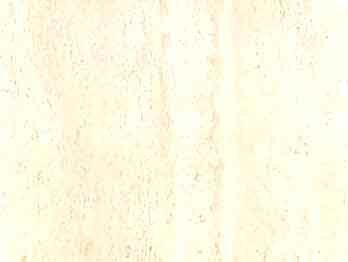 1 Chracas 3960 (December 13, 1742) (http://members.tripod.it/Sichem/chracas2.htm). 2 Ibid. The architect Filippo Barigioni was born in 1690, and died in 1753. 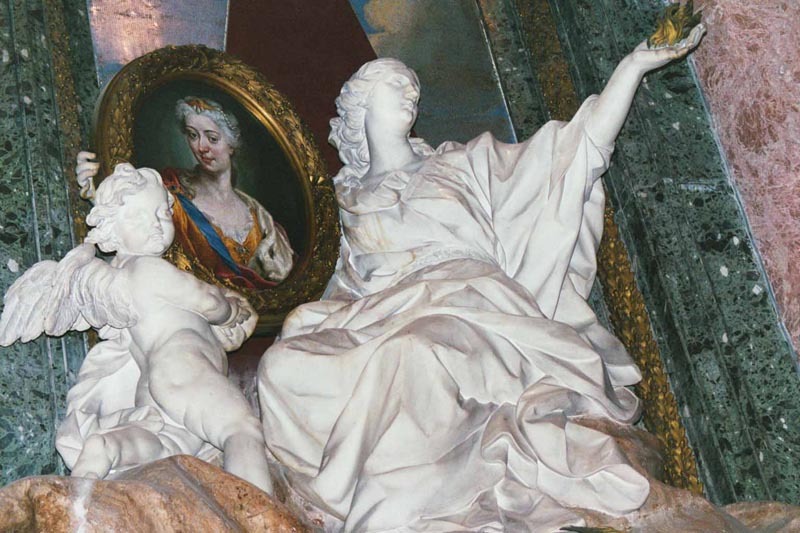 The sculptor Pietro Bracci was born in Rome in 1700, and died in the same city in 1773; he also designed an uncompleted monument to the memory of King James III and VIII. Pietro Paolo Cristofari was born in 1685, and died in 1743; he is responsible for a number of the mosaics in St. Peter's Basilica. The painter Ignaz Stern was born in Mauerkirchen, Bavaria in 1679, and died in Rome, in 1748.